We can customize as per your designs and colours and desired fabric with least minimum quantity order. 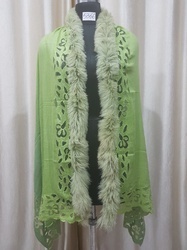 We offer your 85% merino wool with 15% silk with 4 side nett applique and one side real fur trim shawl. Packaging Details: SINGLE PC POLY BAG PACKING.